Holy duplex printing, you purveyor of self-publishing prowess! With colors as vibrant as these, not even the most nefarious of villains can thwart the hours of enjoyment readers will get from your new graphic novel. What Does the Average Graphic Novel Look Like? 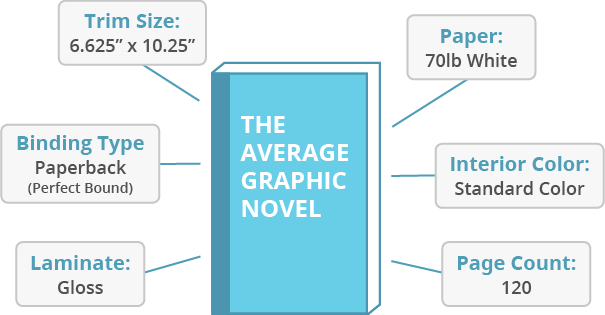 Check out the most commonly used specifications for graphic novels published through IngramSpark. Use our print and ship calculator to determine the actual fees for a book with your title’s particular specifications. Use duplex printing to shock graphic novel fans with some amazing artwork on the inside of the cover, or just start your story that much earlier. It’s up to you. Double rainbow all the way! We're talking about some intense color printing that will knock your hippie socks off. Self-publish in sharp, rich, vibrant color…all the way. Nothing screams amateur hour like ink bleeding through on the reverse page. Our quality paper ensures the only colors readers see on each page are meant to be there. Digital displays love graphic novels. Give your customers more options with simple print-to-digital conversions, guaranteed to make your artwork come alive. When you self-publish your e-book with IngramSpark, we connect you to major online retailers serving customers around the globe. Your book, available on the biggest online retailers in the planet—Amazon, B&N, Apple, Nook, and Kobo—IngramSpark makes it that easy. Ready to bring your story to readers worldwide? We think it's a novel idea.